about the appearance of poison-ivy in the hopes of avoiding the plant in the future. causing ill effects. We must learn some other clues by which to avoid poison-ivy. leaf. Aromatic (or fragrant) sumac will be distinguished below. causes the compounds to be readily absorbed by human's oily skin. body tissues (Godfrey et al. 1971; Windholz et al. 1976). 1 Contribution No. 34, Bureau of Entomology, Nematology and Plant Pathology Botany Section. 2 Botanist, FDACS, Division of Plant Industry, P.O. Box 147100, Gainesville, FL 32614-7100.
ferred by contact. Caution should always be used when handling poison-ivy plants. TAXONOMIC RELATIONSHIPS OF POISON-IVY: Poison-ivy is a member of the family Anacardiaceae. Wunderlin 1982). Mango is cultivated in Florida (Morton 1987) and can cause dermatitis. Inflorescence terminal, fruits red or orange. Flowers appearing after the leaves. be hazardous for the allergic. has been scarred. The ripe fruits are orange (Stevenson 1969). Poisonwood has the same dermatitis effect as poison-ivy. 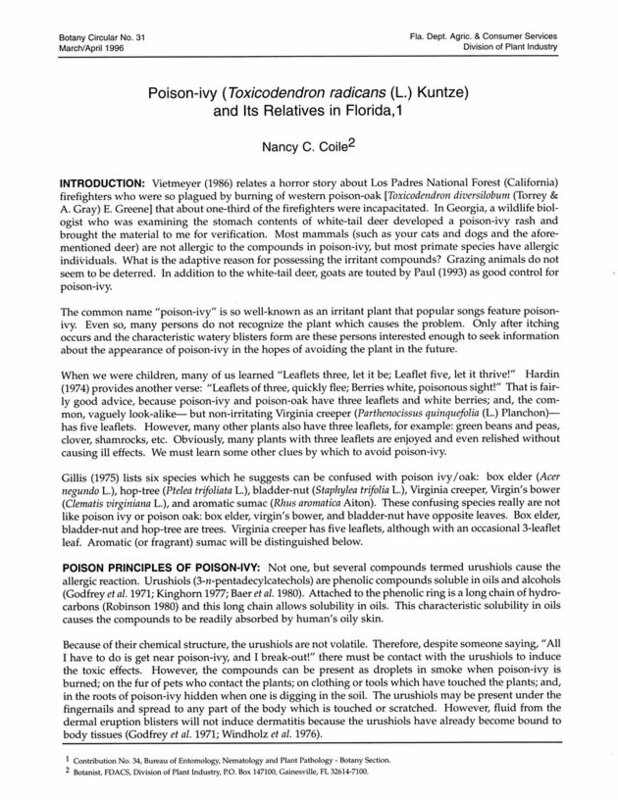 Department of Environmental Protection's "Prohibited Plant List"
and the Florida Department of Agriculture's "Noxious Weed List" Figure 4. Poisonwood. (Photography credit: Walter S. Judd). dermatitis effects are similar to poison-ivy. than humans are able to handle. develop at any time. The first eruptions could be a very severe affliction. gered and no known specimens still exist in Florida. Spondias purpurea is commonly called hog plum. the poison-oak. (Photography credit: Jeffrey W. Lotz). poison-oak control, the 1996 Weed Control Manual (Meister 1996) recommends 2,4-D-phenoxy herbicides. mentally safe. Two treatments of ammonium sulphamate are required to completely kill the plants. at least 87% of poison-ivy. Earlier and later applications were not as effective. of Toxicodendron radicans and variation of urushiol concentrations within one plant. States and Canada. Macmillan Publishing Company, New York. 1290 p.
Arnold Arboretum 43 (4): 359-375. Contribution No. 32. 19 p.
and Agricultural Sciences. Florida Cooperative Extension Service, Gainesville. 324 p.
Correll, D. S. and H. B. Correll. 1982. Flora of the Bahama Archipelago. J. Cramer, Hirschberg, Germany. cautions and eradication. United States Department of Agriculture, Farmers' Bulletin 1972. 16 p.
Daar, S., H. Olkowski and W. Olkowski. 1983. The IPM for poison ivy. The IPM Practitioner 10: 6-10. Agricultural Sciences, University of Florida, Gainesville, Bulletin 172B. 72 p.
Gillis, W.T. 1975. Poison-ivy and its kin. Amoldia 35 (2): 93-123.
sitization and tolerance. The Journal of Immunology 106 (1): 91-102. Alabama. The University of Georgia Press, Athens. 734 p.
Carolina. North Carolina Agricultural Extension Service, Circular 57, 20 p.
Heywood, V.H. 1978. Flowering plants of the world. Mayflower Books, NY. 335 p.
Kinghorn, A.D. (ed.) 1979. Toxic plants. Columbia University Press, New York, NY. 195 p.
Medical Association, Chicago, IL. 432 p.
southern peninsular Florida. University of Miami Press, Coral Gables, FL. 962 p.
Meister, R.T. 1996. Weed control manual. Meister Publishing Company, Willoughby, OH. 538 p.
Morton, J.F. 1987. Fruits of warm climates. Media Incorporated, Greensboro, NC. 505 p.
Gainesville, Circular 441. 91 p.
University of North Carolina Press, Chapel Hill. 1183 p.
edition. Cordus Press, North Amherst, MA. 352 p.
Small, J. K. 1933. Manual of the southeastern flora. University of North Carolina Press, Chapel Hill. the native trees and some of the larger shrubs. Banyan Books, Inc., Miami, FL. 32 p.
Management Notes, USDA Forest Service 47 (1): 23-28.
of chemicals and drugs, ninth edition. Merck & Co., Inc., Rahway, NJ. 1313 p.
firefighters who were so plagued by burning of western poison-oak [Toxicodendron divers\lwfm^Tovvey & A. Gray) E. Greene] that about one-third of the firefighters were incapacitated. In Georgia, a wildlife biologist who was examining the stomach contents of white-tail deer developed a poison-ivy rash and brought the material to me for verification. Most mammals (such as your cats and dogs and the aforementioned deer) are not allergic to the compounds in poison-ivy, but most primate species have allergic individuals. What is the adaptive reason for possessing the irritant compounds? Grazing animals do not seem to be deterred. In addition to the white-tail deer, goats are touted by Paul (1993) as good control for poison-ivy. The common name "poison-ivy" is so well-known as an irritant plant that popular songs feature poison-ivy. Even so, many persons do not recognize the plant which causes the problem. Only after itching occurs and the characteristic watery blisters form are these persons interested enough to seek information about the appearance of poison-ivy in the hopes of avoiding the plant in the future. When we were children, many of us learned "Leaflets three, let it be; Leaflet five, let it thrive!" Hardin (1974) provides another verse: "Leaflets of three, quickly flee; Berries white, poisonous sight!" That is fairly good advice, because poison-ivy and poison-oak have three leaflets and white berries; and, the common, vaguely look-alike but non-irritating Virginia creeper (Parthenocissus quinquefolia (L.) Planchon) has five leaflets. However, many other plants also have three leaflets, for example: green beans and peas, clover, shamrocks, etc. Obviously, many plants with three leaflets are enjoyed and even relished without causing ill effects. We must learn some other clues by which to avoid poison-ivy. Gillis (1975) lists six species which he suggests can be confused with poison ivy/oak: box elder (Acer negundo L.), hop-tree (Ptelea trifoliata L.), bladder-nut (Staphylea trifolia L.), Virginia creeper, Virgin's bower (Clematis virginiana L.), and aromatic sumac (Rhus aromatica Aiton). These confusing species really are not like poison ivy or poison oak: box elder, virgin's bower, and bladder-nut have opposite leaves. Box elder, bladder-nut and hop-tree are trees. Virginia creeper has five leaflets, although with an occasional 3-leaflet leaf. Aromatic (or fragrant) sumac will be distinguished below. POISON PRINCIPLES OF POISON-IVY: Not one, but several compounds termed urushiols cause the allergic reaction. Urushiols (3-n-pentadecylcatechols) are phenolic compounds soluble in oils and alcohols (Godfrey et al. 1971; Kinghorn 1977; Baer et al. 1980). Attached to the phenolic ring is a long chain of hydrocarbons (Robinson 1980) and this long chain allows solubility in oils. This characteristic solubility in oils causes the compounds to be readily absorbed by human's oily skin. Because of their chemical structure, the urushiols are not volatile. Therefore, despite someone saying, "All I have to do is get near poison-ivy, and I break-out!" there must be contact with the urushiols to induce the toxic effects. However, the compounds can be present as droplets in smoke when poison-ivy is burned; on the fur of pets who contact the plants; on clothing or tools which have touched the plants; and, in the roots of poison-ivy hidden when one is digging in the soil. The urushiols may be present under the fingernails and spread to any part of the body which is touched or scratched. However, fluid from the dermal eruption blisters will not induce dermatitis because the urushiols have already become bound to body tissues (Godfrey et al. 1971; Windholz et al. 1976). Contribution No. 34, Bureau of Entomology, Nematology and Plant Pathology Botany Section. Botanist, FDACS, Division of Plant Industry, P.O. Box 147100, Gainesville, FL 32614-7100. The urshiols are found in the resin ducts in the roots, stems, leaves, and flowers (Kinghorn 1979; Epstein 1991). In the unlikely event that the resin ducts are undamaged, then the dermatitis-provoking compounds are safely sequestered. However, due to a tempestuous, wind-tossed environment, the plants will have damaged resin ducts and will have the oily compounds on all surfaces of the plants and will be transferred by contact. Caution should always be used when handling poison-ivy plants. TAXONOMIC RELATIONSHIPS OF POISON-IVY: Poison-ivy is a member of the family Anacardiaceae. In Florida, there are five dermatitis-causing species of Anacardiaceae which are encountered in natural or disturbed areas: poison-ivy, poison-oak, poison-sumac, poisonwood and Brazilian pepper. Only the last is exotic, the others are native (Clewell 1985; Godfrey 1988; Long and Lakela 1972; Small 1933; and Wunderlin 1982). Mango is cultivated in Florida (Morton 1987) and can cause dermatitis. Anacardiaceae consists of about 73 genera and 850 species of trees, shrubs, or woody vines with resinous ducts (sometimes with latex-channels); simple, trifoliate, or pinnately compound leaves, usually alternate, not gland-dotted; the 5-merous flowers are small, usually superior, often imperfect and often have intrast-aminal nectariferous discs; the fruits are drupes with resinous mesocarp. The resin may exude and result in black patches on plant surfaces. Members of the family are mostly pantropical, but extend into subtropical, Mediterranean climates, and temperate climates of Eurasia and North America (Brizicky 1962; Cronquist 1981; Heywood 1978; Mabberley 1989; Zomlefer 1994). The family name is based on Anacardium, a genus of eight tropical species which includes the cashew (A. occidentale L.). Anacardium occi-dentale provides the cashew "nut" and also develops from the fruit stalk a soft, swollen structure called the cashew-apple, which does not travel well and is mostly unknown outside the tropics. The oils in cashew-nut are allergens, but the allergens are destroyed by the roasting process (Gillis 1975). Some other well-known Anacardiaceae which can cause dermatitis are lac tree [Toxicodendron vernicifluum (Stokes) Barkley] which is used to produce lacquerware (Mabberley 1989) and Schinus molle L., California pepper tree (Hickman 1993). Stem climbing or trailing, fruits glabrous Stem erect, fruits hairy. Flowers appearing before the leaves Flowers appearing after the leaves. Gillis (1975) places the sumac-like species which cause dermatitis into the genus Toxicodendron, and today this is the most accepted classification. In the past, there has been much controversy about whether to use Rhus or Toxicodendron (Small 1933; Radford et al. 1964) as the proper genus for this group of species. Rusts which attack Toxicodendron do not attack Rhus (Gillis 1971). It is common that organisms other than humans can distinguish close "taxonomic relatives" because they cue in on a larger suite of characteristics than humans are able to handle. In Florida, there are three species of Toxicodendron and all contain ample urushiol compounds which will cause dermatitis in susceptible persons. Lampe and McCann (1985) call ordinary plant dermatitis "contact urticaria" and the dictionary defines urticaria as itching skin eruptions. The degree of skin reaction to dermatitis-causing plants will vary from person to person (Coile 1995). One should not assume immunity to the effects of urushiol in poison-ivy, poison-oak or poison-sumac because the allergic reactions may develop at any time. The first eruptions could be a very severe affliction. Rhus aromatica Aiton, R. copallinum L., R. glabra L., R. michauxii Sarg., and Spondias purpurea L. do not contain the allergenic urushiols. Rhus aromatica occurs only in westernmost panhandle (Godfrey 1988) and, as the name implies, it is fragrant. Like poison-oak, R. aromatica is shrubby and has three leaflets highly reminiscent of poison- ivy. Rhus copallinum (winged sumac) and R. glabra (smooth sumac) are common shrubs often seen along highway right-of-ways. Rhus michauxii (Michaux's sumac) is federally endangered and no known specimens still exist in Florida. Spondias purpurea is commonly called hog plum. [Ximenia americana L., Olacaceae, also called hog plum, usually is called tallowwood.] Spondias purpurea is a naturalized introduction from tropical South America. No more text will be devoted to these non-aller-genic species of Anacardiaceae. FLORIDA'S TOXIC ANACARDIACEAE: Toxicodendron toxicarium (Salisb.) Gillis, eastern poison-oak, is shrubby and has three leaflets which usually have margins lobed somewhat like oak leaves. The leaves are blunt to rounded at the tips (Godfrey 1988). Inflorescences are panicles on very short erect stalks. The fruits are hairy Eastern poison-oak is found in dry habitats throughout Florida. A synonym is Rhus toxicodendron L.
Toxicodendron radicans (L.) Kuntze, poison-ivy, has acute or acuminate leaflet tips. The leaflets are not as oak-like as those of poison-oak, although there is often some lobing. The inflorescences are usually larger than those of poison-oak. Flowers are small, whitish. The fruits are glabrous. Poison-ivy is found throughout Florida in moist to wet habitats (Godfrey 1988). A synonym is Rhus radicans L. Flewellyn Podris, DPI Environmental Specialist, and I observed flower clusters of poison-ivy which were floating in a pool after they fell from high in a tree where poison-ivy had climbed. Since I am allergic, my curiosity could have led to dermatitis; use caution, the flowers may fall far from the source. The older stems of poison-ivy may be up to 8 cm wide and are shaggy with aerial roots. Cutting trees with poison-ivy vines can be hazardous for the allergic. (Photography credit: Hubert W. Collins Jr.). Toxicodendron vernix (L.) Kuntze, poison-sumac or thunderwood, has seven to 15 leaflets per leaf. The inflorescences droop or arch and are axillary. The white drupes are about 5-6 mm wide. Patches of dark, dried resin are often seen on the trunks of these shrubs or trees. (These black patches call to mind the black lacquerware described above.) Poison-sumac occurs in the panhandle and northern Florida in bogs or wet thickets. All three of the Florida species of Toxicodendron extend northward to Canada (Godfrey 1988). Poison-sumac is not as common as poison-ivy or poison-oak. An excellent guide to all three of the Toxicodendron species listed above is provided by Crooks and Klingman (1972) and by Hardin (1974). Hardin's bulletin is no longer in print. Metopium toxiferum (L.) Krug & Urban, poisonwood, is a shrub or tree fairly common in hammocks in south Florida and the Keys. This species is also found in Cuba, Haiti and Puerto Rico (Correll and Correll 1982). Leaves may have three to seven leaflets (Long and Lakela 1971), but a five-leaflet leaf is the most common form. The bark is light reddish brown and flakes to show the orange underbark (Stevenson 1969). The flaking bark has caused some to dub this "tourist tree" but that common name more appropriately belongs to Bursera simaruba, gumbo-limbo, which has a red underbark. As in poison-sumac, dark patches of dried resin is present where the trunk has been scarred. The ripe fruits are orange (Stevenson 1969). Poisonwood has the same dermatitis effect as poison-ivy. Schinus terebinthifolius Raddi, Brazilian pepper-tree or Florida-holly, is a shrub with arching branches. Leaves have three to 11 leaflets, and when crushed there is a strong turpentine scent. White flowers are in large diffuse panicles. The flowers are followed by glossy drupes which ripen to red or orange-red and are about 6 mm wide (Long and Lakela 1971). This exotic species was formerly touted as a beautiful tree due to its showy fruits. Now, Brazilian pepper is on the Florida Department of Environmental Protection's "Prohibited Plant List" and the Florida Department of Agriculture's "Noxious Weed List" because S. terebinthifolius has become the dominant plant on many canals, ditchbanks, lakesides, and other moist sites, crowding out native species. The fruits are dispersed by birds and by water. The dermatitis effects are similar to poison-ivy. Figure 4. Poisonwood. (Photography credit: Walter S. Judd). Mangifera indica L., the magnificent tropical fruit native to southern Asia (Morton 1987), is grown in South Florida as a crop and has naturalized in hammocks (Small 1933). In susceptible persons, the resinous sap of the plants will cause a poison-ivy type of rash. Rarely, persons are highly allergic to mango fruits, and Morton (1987) cautions the susceptible person to peel the resinous skin of the fruit carefully and to use a different knife for cutting the flesh from the seed. Pollen can cause watery, itching eyes and smoke from burning wood is highly irritant (Perkins and Payne 1978). CONTROL OF POISON-IVY: Biological control of native species is contrary to the tradition of classical biological control which is usually aimed against introduced plant species (Habeck 1989). Only the importance of these dermatitis-causing species could interest biologists into pursuing biological control for these natives. Habeck provides a list of numerous insects and mites which are possibilities for biological control of poison-ivy. Goats, deer, and other grazing mammals are also candidate biological control agents. For control, Hardin (1974) recommends digging or cutting and use of 2,4-D herbicides. For poison-ivy and poison-oak control, the 1996 Weed Control Manual (Meister 1996) recommends 2,4-D-phenoxy herbicides. See Meister and Colvin (1995) for herbicides to use in specific areas. Daar et al. (1983) recommend use of ammonium sulphamate for control because the breakdown products of nitrogen and sulfur are environmentally safe. Two treatments of ammonium sulphamate are required to completely kill the plants. Poison-ivy is one of the weeds used in Younce and Skroch's 1989 study of weed control with glyphosate (Roundup). Application of 2.2 kg/ha from mid-June through mid-August in North Carolina controlled at least 87% of poison-ivy. Earlier and later applications were not as effective. Coile, N.C. 1995. A list of some plants known to cause dermatitis, a guide for DPI plant protection and environmental specialists. Florida Department of Agriculture and Consumer Services, Division of Plant Industry. Bureau of Entomology, Nematology and Plant Pathology, Botany Section Contribution No. 32. 19 p.
Colvin, D. (ed.). 1995. 1995 Florida weed control guide. SP-53. University of Florida, Institute of Food and Agricultural Sciences. Florida Cooperative Extension Service, Gainesville. 324 p.
Correll, D. S. and H. B. Correll. 1982. Flora of the Bahama Archipelago. J. Cramer, Hirschberg, Germany. 1692 p.
Cronquist, A. 1981. An integrated system of classification of flowering plants. Columbia University Press, NY. 1262 p.
Crooks, D.M. and D.L. Klingman. 1972. Poison ivy, poison oak and poison sumac identification, precautions and eradication. United States Department of Agriculture, Farmers' Bulletin 1972. 16 p.
Dickey, R. D. 1968. Ornamental vines for Florida. Agricultural Extension Service, Institute of Food and Agricultural Sciences, University of Florida, Gainesville, Bulletin 172B. 72 p.
Figure 5 Brazilian-pepper. (DPI file photograph). Medicine 2: 183-186. Gillis, W.T. 1975. Poison-ivy and its kin. Arnoldia 35 (2): 93-123. Godfrey, H.P., H. Baer and R.C. Watkins. 1971. Delayed hypersensitivity to catechols, V. absorption and distribution of substances related to poison ivy extracts and their relation to the induction of sensitization and tolerance. The Journal of Immunology 106 (1): 91-102. Godfrey, R. K. 1988. Trees, shrubs, and woody vines of northern Florida and adjacent Georgia and Alabama. The University of Georgia Press, Athens. 734 p.
Habeck, D.H. 1990. Insects associated with poison ivy and their potential as biological control agents. IN: Delfosse, E.S. (ed.) 1989. Proceedings, VIII International Symposium on Biological Control of Weeds, 6-11 March 1988, Rome, Italy, Instituto Sperimentale Patologia Vegetale, Ministero Agricoltura Foreste: 329-337. Hardin, J.W. 1974. Things you should know about poison ivy, poison oak and poison sumac in North Carolina. North Carolina Agricultural Extension Service, Circular 57, 20 p.
Hickman, J.C. (ed.) 1993. The Jepson manual of higher plants of California. University of California Press, Berkeley. 1400 p.
edition. Cordus Press, North Amherst, MA. 352 p. Small, J. K. 1933. Manual of the southeastern flora. University of North Carolina Press, Chapel Hill. Younce, M.H. and W.A. Skroch. 1989. Control of selected perennial weeds with glyphosate. Weed Science 37: 360-364. Zomlefer, W.B. 1994. Guide to flowering plant families. The University of North Carolina Press, Chapel Hill. 430 p.
this document on behalf of the State of Florida and shall be considered the copyright holder for the text and images of these publications. The Florida Division Of Plant Industry has made this publication available to the University of Florida, on behalf of the IMLS grant Linking Florida's Natural Heritage, for purposes of digitization and Internet distribution. publication. All uses, excluding those made under "fair use" provisions of U.S. Code, Title 17, Section 107 are restricted. (http://doacs.state.fl.us/~pi/index.html) for additional information and permissions.